Award-winning singer songwriter Kaz Hawkins will include a concert in Larne during her Irish tour. The show will take place at the McNeill Theatre, at Larne Leisure Centre, on Sunday May 5. Soul singer Kaz has worked tirelessly for different charities over the years. 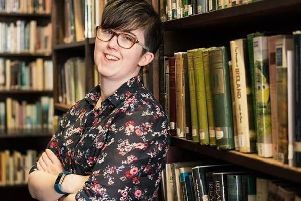 She is now the official ambassador for Aware NI and has completed a library tour featuring sessions at Boston University, Florence Academy of Fine Arts in Alabama where the Belfast singer told her life story using words and song to illustrate how music can be used as a mental health tool. When she isn’t touring, Kaz presents her own radio show “Kaz Hawkins Got The Blues” on BBC Radio Ulster. Kaz has now joined the UK Blues Federation as a board member and aims to bring more exposure across the UK to the rich blues and soul artists in Northern Ireland. The concert is being presented by The Music Yard and Inspire Gym, Larne. Tickets are priced at £17.50. For further details, see Kaz’s Facebook page.